The GFS shows an area of low pressure that drifts slowly southward through the eastern Pacific the next few days. By this weekend it gains a little strength and ends up west of the Baja Peninsula. By Sunday night it moves into the Baja Peninsula. 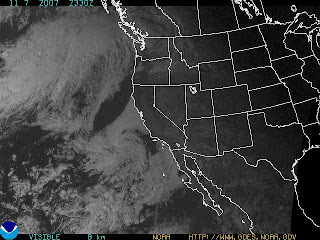 Monday night it begins to move into the Southwest U.S., crossing through Arizona and New Mexico. By Tuesday night it is centered near Dallas, TX. All of this can and will change, relative to timing. But, if the GFS is correct, the above satellite image shows the "genesis" of next week's storm is now underway in the East Pacific.